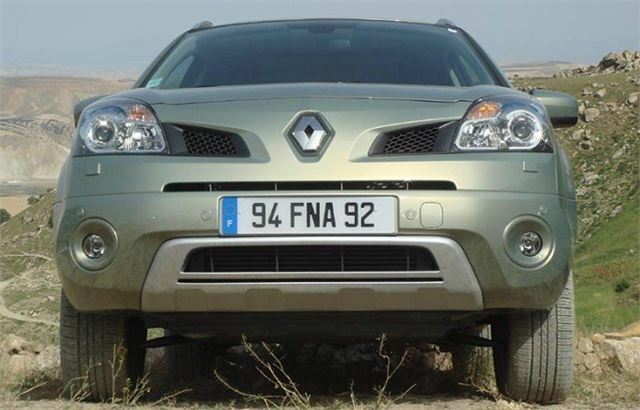 Up against at least 23 direct competitors, and a total of 65 other 4x4 SUVs the Renault Koleos had better be good. 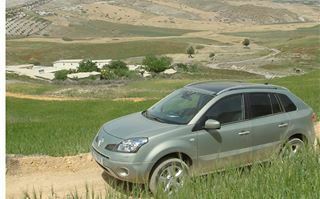 Renault doesn’t call it a ‘4x4’ or an ‘SUV’. Instead it prefers the title ‘Crossover’. 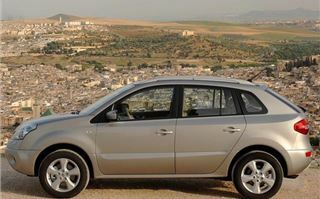 By which it means a cross between a hatchback, a 4x4 and an MPV. And it reckons that, coming almost last in the race to build this sort of vehicle, it has learned from the successes and failures of everything in front of it. For example, the rear seat folding mechanism is clever, and a bit like the Hyundai Tucson and Kia Sportage’s. You pull a lever either side of the hatchback and both sides of the 60/40 split rear seat flop down leaving a flat, unobstructed floor. 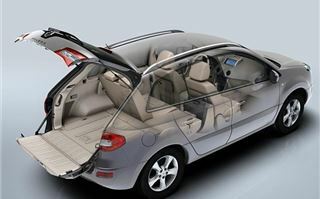 Instead of one big hatchback, the tailgate is split horizontally, so the top lifts up and the bottom hinges down, like a Mitsubishi Outlander’s, taking 200kg, so two people can sit on it spectating at an event, or while pulling on their Wellingtons. 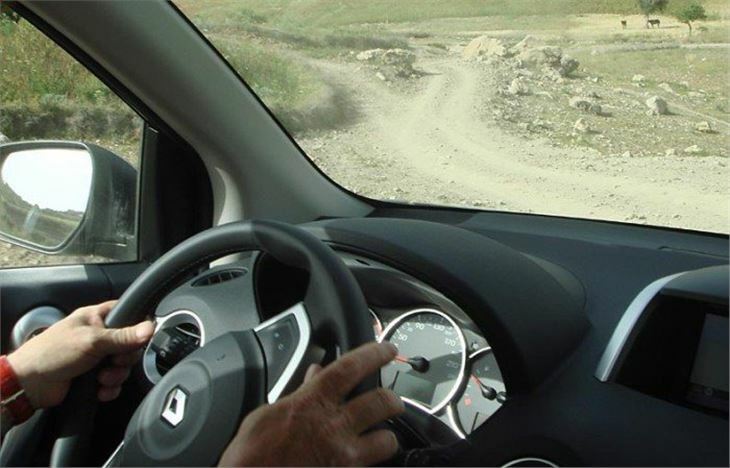 Rather than a limp-wristed excuse of a 4WD system, like a CR-V’s or RAV-4’s, the Koleos has the full Nissan X-Trail kit, that selects 4wd automatically when needed, allows you to lock the centre diff and has a clever pushbutton hill descent control that even works in reverse. Renault hasn’t fitted bonkers bling wheels to jar your spine and rearrange your internal organs. All Koleos come on 17” with pothole and hump absorbent 225/60 profile tyres. There are cubbies everywhere, even in the floor, like a Renault Scenic’s, and the deep cubby under the centre armrest lifts out like a bucket, so you can tip things out and clean it. The only engines fitted are chain-cam diesels. No timing belts to snap. And new technology. The base engine is 191g/km CO2, the more powerful 175 is 209g/km and even the automatic is 221g/km. Usefully under 226g/km where VED will jump to £415 next year. Fuel economy claims aren’t exaggerated, ranging from 39mpg for the standard engine with manual gears down to 34mpg for the automatic. So you probably won’t be disappointed like many Freelander II diesel automatic owners have been. 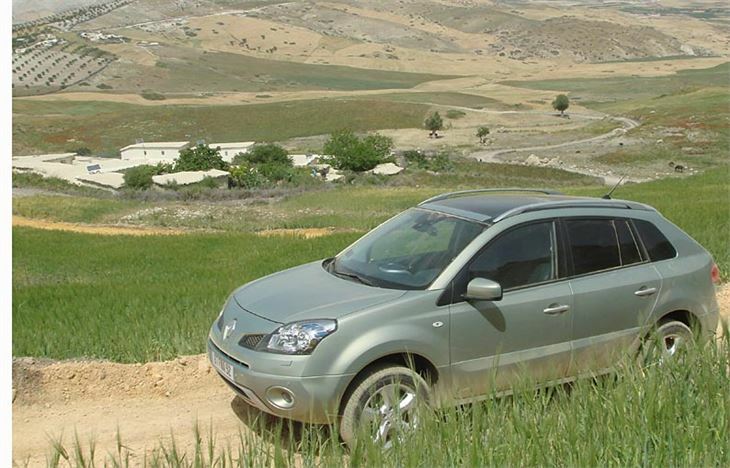 Designed by Renault, Developed by Nissan and built by Samsung in Busan, South Korea, Project H45 (which became the Koleos) has a lot of other thoughtful features. It’s very quiet inside because engine noise is heavily insulated from the cabin. Rear seat passengers get their own individually controlled heating and air-conditioning vents, built into the door pillars. The hazard warning button is huge, triangular-shaped and right in the middle of the dash. The steering wheel adjusts up and down and in and out. Both front windows are one-touch. The front passenger seat back folds down forwards, becoming a table or allowing you to carry planks of wood up to 2.6 metres (8’ 6”) long. There’s a fold down panoramic mirror for keeping an eye on kids in the back seat. It has huge disc brakes, capable of stopping the car from 62.5mph in 40 metres. And there is already an established range of dealer fit extras, such as towbar, bike rack, even a tent. Driving pre-production cars it’s all too easy to get a bad one and base all your findings on that. So it was fortunate this launch was split into two days with two identical spec but different cars, giving us two chances to get a representative example. The good one was very good indeed. Sweet, free-revving, reasonably powerful diesel engine, though not a slugger. The engine gives 150Nm torque at 1,000rpm, 300Nm at 1,500rpm, but doesn’t deliver its peak of 360Nm until 2,000rpm. However, on a long straight we saw 210kmh on the clock, which is 130mph and 13mph over its official top speed. Impressively, it felt very stable at that speed, whatever it really was. 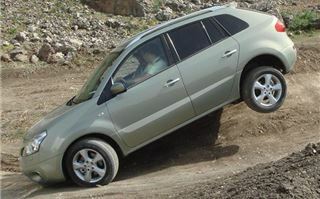 Grip, roadholding and handling are very good for an SUV. It’s only prone to lift-off understeer if you go into a corner too fast and, instead of balancing the car with more power, you lift off. Give it more beans on the apex and as long as you’re not doing really silly speeds, it tucks in nicely. The ride on rough Moroccan tracks was outstanding. 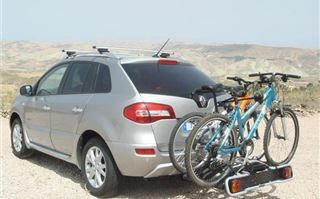 As good as a Hyundai Santa Fe’s. The 6-speed gearbox shifts reasonably precisely. It’s not a sweet shift, but it’s fine. Off road it’s every bit as capable as an X-Trail, which is high praise in this sector, only likely to be beaten by a Freelander II, and that’s arguable. It’s attractive, deliberately styled to be unaggressive, which has to be applauded. From the front it actually looks like a Clio on stilts, which isn’t going to threaten or intimidate anyone. 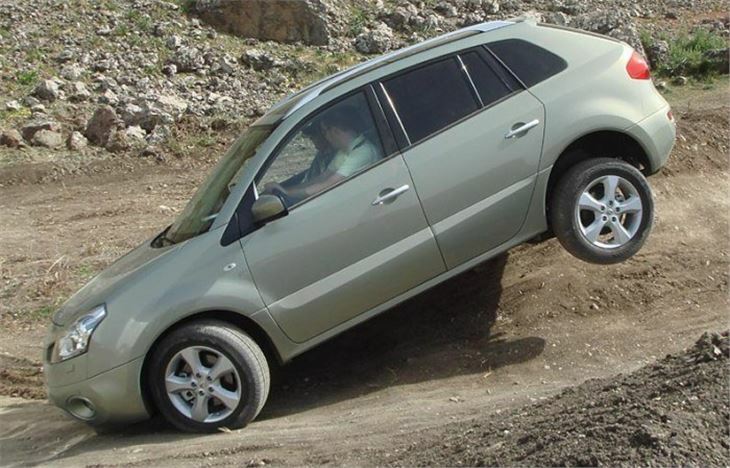 And, if the furthest off road you’re ever likely to venture off road is up a kerb, you can save yourself £1,000 and about 1 mile per gallon by opting for the two-wheel drive version. That will serenely shrug off stupid speed humps and potholes and look the part without dragging along unnecessary driveshafts. The Koleos isn’t just a worthy contender for your money, it’s one of the best. 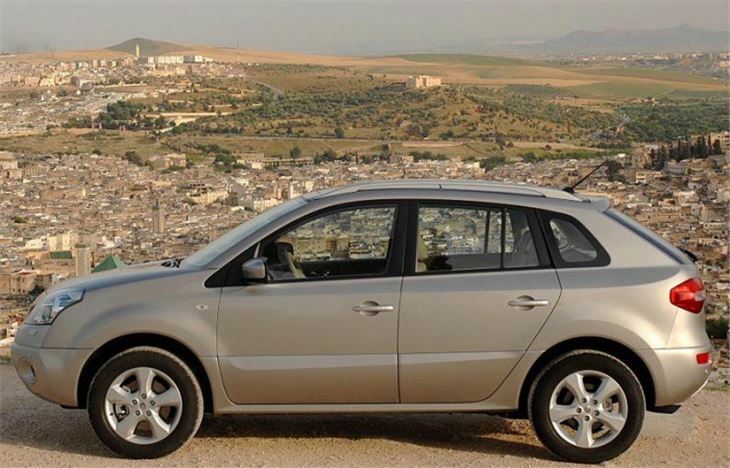 And well worth a test-drive, whether it’s taking the kids to school, towing a small horsebox or driving through mountains in Morocco.